Although segregation has been struck down in the country, Southern states still prevent African-Americans from registering to vote. Martin Luther King Jr. (David Oyelowo), having just received a Nobel Peace Price, urges President Lyndon B. Johnson (Tom Wilkinson) to pass a law, now known as the Voting Rights Act of 1965, that will make it illegal for American citizens, despite one’s color, to be discriminated against and hindered from voting. 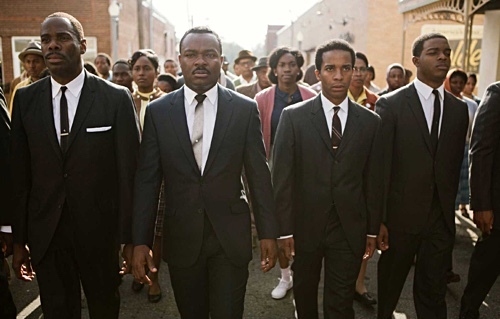 To inspire the president to pass the federal legislation, Dr. King and his colleagues arrange a peaceful march from Selma to Montgomery, Alabama. “Selma,” written by Paul Webb and directed by Ava DuVernay, balances rousing and small moments with elegance and panache. It commands a silent power that bleeds through one scene to the next and by the time Dr. King must deliver a speech, it is urgent, explosive, and moving—a reminder that when it comes to racial discrimination, our country, despite its progress, still has long way to go. Oyelowo is magnetic in playing a monumental public figure. I admired that he has found a way to communicate that his character is very much a man of intellect and yet he knows how to talk to people in such a way that he almost always ends up getting what he sets out to accomplish. This is difficult to do; a less capable performer might have relied on physical or aural resemblance to create a character rather than wearing the skin and living that character. Oyelowo is a joy to watch whether it be during powerful speeches or moments of vulnerability when having a real conversation with his wife (Carmen Ejogo). The fight between husband and wife that takes place in the middle of the film is critical because it shows Dr. King as an imperfect man. In school, we learn about the man’s great accomplishments. Here, we get a chance to learn the difference between Dr. King in the public sphere versus Martin in the private sphere. The fight humanizes the figure. It is most appropriate that the scenes which command the most attention take place on the Edmund Pettus Bridge. There is real tension as hundreds of black people march toward a white police force, the latter all too-ready to use their tear gas, guns, whips, clubs. Not only is the brutality of violence captured but also the sheer hatred toward The Other. These are not scenes of violence that come across as rehearsed and so we watch in real horror as helpless individuals—a lot of them of a certain age—getting thrown around and pummeled without restraint. It is necessarily that we absorb this violence as if it were being done to us or our loved ones, especially viewers of color. The film is criticized for some inaccuracies but I am not a historian. What I do know, however, is that the material is worth seeing because it is well-acted, beautifully photographed, and its essence remains relevant in modern day America. And yet, which I found most refreshing and surprising, the work has a certain relaxed quality about it. It is not solely composed of one important scene after another. It actually gives us some time to breathe, process and, perhaps most importantly, to make connections regarding racial tensions in our country today. Duvernay got robbed of an Oscar nomination for this. Couldn’t agree more. Plus, really moving performances all around. Yeah, Oyelowo got robbed too for that matter.